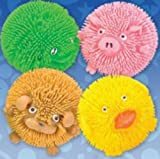 This crazy collection of puffer ball figures features a variety of cute critters. Our puffer balls are distinguished by soft rubbery spikes. Assortments of colors and characters may vary.